Corner shaped sand pit with colourful beach hut decorated backboards to transport you to the seaside. Free standing unit so can be positioned where you like. Ideal for a corner plot in your outdoor space. Sandpit in two halves, each with a lid. Fill with sand or other materials to create a seaside theme. When lids are in place, doubles up as a platform to sit or perform on. Platform height 15cm. Sandpit will require approx. 8 – 10 bags of 15kg sand (depending how full you want to make it). Price includes delivery and assembly on site. Made from pre-treated Scandinavian Redwood which is guaranteed against rot and insect infestation for 10 years. 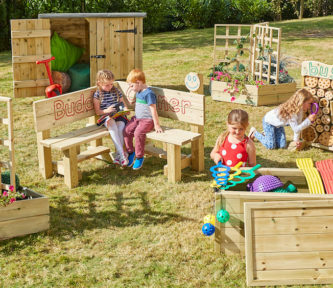 Co-ordinates well with the free standing Seaside Village Beach Huts (available separately) – great for den making, as an outdoor reading nook and for storage.